On paper it looks promising: a family of venerable and versatile artists, coming together to celebrate their shared heritage and musical chops. 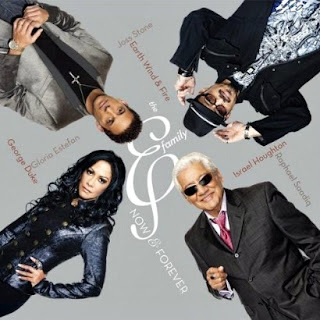 However, The E Family—father Pete Escovedo along with his children, siblings Juan Escovedo, Peter Michael Escovedo, and the family’s most mainstream-famous member, Sheila E—seldom live up to their collective potential on Now and Forever (Fontana/Universal), eschewing what could have been a masterclass of dynamic musicianship to instead favor a mostly homogeneous mix of R&B and Latin jazz. The album’s very last track, “Live Percussion Jam,” is also its strongest, most-satisfying moment. Joyful and irresistibly infectious, it offers the finest indication of what this project could have achieved overall. Of particular concern is the conspicuous absence of Sheila E on lead vocals. Granted her strong suit is playing the drums, but the lady is by no means a slouch when it comes to singing—crank up “Love Bizarre” and “The Glamorous Life” for rump-shaking evidence—and that aspect of her artistry could have added some much-needed spice and sexiness here. Instead, those attributes come courtesy of Joss Stone, who injects an extra shot of oomph into “The Other Half of Me” to make this otherwise average R&B groove a soulful success and the album's only other highlight. Additional guests, including Earth, Wind & Fire, Gloria Estefan, and Raphael Saadiq, don’t contribute anything nearly as impressive or convincing. It’s just as well, as the Escovedo clan didn’t exactly give them much to work with anyway. Consider this one a missed opportunity.